September is the perfect lawn renovation month for our area. Aeration is a key step in the renovation process. Aeration is one of the most important cultural practices available for your lawn. Aeration is the process of removing thousands of small cores of soil 1″ to 3″ in length from your lawn. 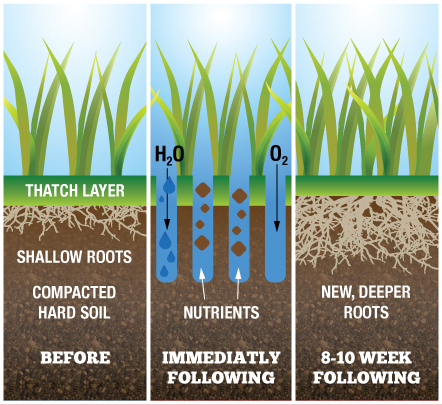 This process helps control thatch, improves the soil structure, helps create growth pockets for new roots, and opens the way for water and fertilizer to get to the roots of your lawn. Thatch on your lawn’s soil works like a thatched roof. It sheds water and prevents fertilizers and insect controls from moving freely into the soil. Thatch that has become too thick can require a major lawn renovation. Aeration helps thatch to break down naturally by mixing the soil cores into the thatch and speeding up the decomposition process of the thatch. Call Hillermann’s at 636-239-6729 for professional help with Core Aeration and all your fall lawn maintenance.